All too often, people put off estate planning. This is understandable as, rather than preparing for the here and now, it requires you to consider what will happen when your life is over, hardly something most of us rush to contemplate. Consequently, estate planning often becomes, and all too often remains, a do-it-tomorrow task. When it could suddenly become all-important it might be too late. After all, accidents and illnesses can and do happen. This guide will help you prepare effective plans that will help ensure you control what happens to your estate. You decide on the choice of beneficiaries: If you do not set out in a will whom you wish to benefit from your estate, then the state will do it for The results are not always what you would expect and can create unnecessary tax liabilities. You decide what goes to whom: You might want to leave a particular item to a particular Without estate planning, those wishes may not become reality. You decide the structure: Leave it to the state to distribute your wealth and normally anyone aged 18 or over will receive their inheritance In some families, that will not be an issue, but in others placing some constraints on how an inheritance is handled could be essential. With estate planning in place, you will have addressed these important issues rather than left them on permanent hold. However, like all other aspects of financial planning, your estate planning will need regular review. Planning point – Assess your assets and how you would like to dispose of them. Answer the questions and discuss them with your partner and, if appropriate, your family. Failure to prepare a will means your estate will fall under the rules of intestacy. This default can produce some surprising – and unwelcome – results, as explained below. Your will needs to be kept up to date. Something that was prepared a decade ago may still be satisfactory, but across such a long period of time your situation and your family’s circumstances will probably have changed. Tax legislation has certainly done so. Remember too that marriage will normally result in the automatic revocation of an existing will. Divorce does not have the same effect, but it does treat the former spouse or partner as having died before the will becomes operative. 1.Appointments and funeral wishes The duty of executing the terms of your will falls to the people you appoint as executors in the will. It is best to appoint at least two executors: your husband/wife or civil partner alone – if they survive you – may struggle to cope with bereavement and estate administration. The choice of executors (and guardians for minor children) is not one to be taken lightly, as both roles involve considerable responsibility. The first section of the will often also deals with funeral arrangements, such as whether you want to be cremated, and perhaps where your ashes should be scattered. 2.Distribution This central part of the will sets out the ‘who, what, when and how’ of your bequests. This will include specific legacies of cash and/or particular assets to named individuals or charities. You may want a surviving husband/wife or civil partner to receive the income from your estate, but on their death you would want any capital to pass to your children from a previous Again, a trust can achieve this. In some instances, it may be best to leave the decision on the distribution of the residue to trusted members of the family or friends, acting as You can give them guidance and in your will include a list of potential beneficiaries. However, as your trustees have the final decision, they will be able to take account of the circumstances upon your death. 3. Executor/trustee powers: This final section of your will is the part that sets out in legal terms the powers of your executors and, if any trusts are created by your will, the powers given to the trustees. Usually the will is drafted to maximise their flexibility of operation. A will can be as simple as a few lines or it can be complex and cover many pages. DIY wills are possible and many people use a simple will form or online will-writing services. Whoever prepares your will, it remains a legal document, a point which has regularly created problems in the interpretation of DIY wills. For your own and your family’s peace of mind, in nearly all cases it is best to have your will prepared by a solicitor or professional will writer. The error in a poorly drafted will may only emerge after it is too late for you to make any changes. Planning point – Take some time to review your existing will, with your husband/wife or civil partner. And review theirs. Do they still reflect your current circumstances and wishes? Before your executors can carry out the terms of your will, they need to obtain probate. This usually involves a considerable amount of paperwork, most notably IHT returns and payment of any inheritance tax and probate fees due. If your estate does not have enough cash to cover these levies, your executors may need to borrow to meet the bill. A loan may also be necessary in the future to cover the cost of probate. The Ministry of Justice recently introduced legislation to increase probate fees in England and Wales, replacing the maximum fee of £155 where a solicitor is involved (£215 for an individual application) with a tiered scale running up to £6,000 on estates valued at over £2 million. The new probate fees will apply from April 2019. Whether or not you have a will, anything you own jointly with someone else will pass to the other joint owner(s) on your death. The exception to this arises where your ownership takes the form of a tenancy in common (which would be unusual for married couples and civil partners). If you die without having a valid will, the laws of intestacy apply. These differ depending on the part of the UK in which you are domiciled – which may not necessarily be the same as the country where you are living when you die. Intestacy rules often do not produce the distribution of your estate that you might expect. For example, the surviving husband/wife or civil partner will not necessarily receive everything, as the example overleaf shows. Ann received £250,000 outright and Henry’s personal chattels. Ann was also entitled to half of the remaining estate (i.e. £300,000). The other £300,000 passed immediately to Patrick, the 37-year-old ‘permanent student’ son from Henry’s first brief marriage in the early 1980s. Unscrambling the unfortunate effects of intestacy may be possible using a legal document called a deed of variation, but it requires the agreement of some parties to give up all or part of their benefits. They may be legally unable to do so because they are minors or they may be adults who are unwilling to do so – like Patrick in the example above. There could be similar difficulties with attempts to rectify wills after a death; family ties may not count for much when money is involved. Whenever you make (or amend) your will, you should also consider putting in place a lasting power of attorney (LPA). There are two types of LPA, both of which let you appoint one or more people (your attorneys) to make decisions on your behalf if infirmity prevents you from doing so. Your daily routine (e.g. eating, washing, dressing). The provision of medical care. If you should move into residential or nursing care. Whether life-sustaining treatment should be refused. Sorting out your tax affairs. Property and finance LPAs replaced the old enduring power of attorney (EPA) in October 2007. EPAs established before the changeover are still valid, regardless of whether they have been registered. Although not strictly part of estate planning, arranging LPAs can be of great value to your beneficiaries, as they allow your affairs to be handled efficiently later in life. As with intestacy, there is a state fall-back (through the Public Guardian), but the whole process can be slow, expensive and impersonal. Planning point – Establishing LPAs can be very beneficial for your family in managing your affairs should the need arise. 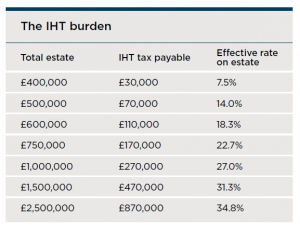 Do not ignore the impact of inheritance tax (IHT). Very broadly speaking, IHT is levied on your estate at death and on certain gifts made during your lifetime. If you make an outright lifetime gift, regardless of its size, you pay no IHT initially, but the value of the gift is brought back into your estate if you die within the following seven years. Other lifetime gifts that you do not make outright – notably gifts into most types of trust – usually attract lifetime This is at a lifetime rate of 20% to the extent that they exceed your available nil rate band and any exemptions. There may also be further tax, up to another 20%, if you die within the following five years. Planning point – Inheritance tax is generally charged at 40% on death and 20% on certain lifetime gifts. Transfers between spouses and civil partners: These are exempt from IHT, provided the recipient is domiciled in the UK. Non-domiciled aspects are beyond the scope of this guide. The transferable nil rate band: To the extent that one spouse or civil partner does not use their full nil rate band at death, it is transferable to the survivor’s estate. The precise rules are complex, but the effective result is that a couple currently has a combined nil rate band of up to £650,000 (£325,000 x 2). The transferability means that there is no need to ensure that the first of a couple to die uses their nil rate band, as was the case before transferability was introduced in 2007. Residence nil rate band: An additional nil rate band has been introduced to be set against the value of your home where it is left to a direct descendant. The band is £125,000 for 2018/19 and will increase by £25,000 a year until 2020/21, when it reaches £175,000. Like the nil rate band, any unused portion is transferable between spouses and civil partners, but unlike the nil rate band it is subject to a 50% taper if your estate is worth more than £2 million. Special rules deal with downsizing or selling up completely (e.g. on moving into a care home). Jack and Jill each had an estate of £1.2 million when Jack died in June 2020. His will left everything to Jill, who died eight months later. Thus, Jill inherited 100% of Jack’s nil rate band and, as his estate was under £2 million, 100% of his residence nil rate band (of £175,000). However, on Jill’s death her estate was worth £2.4 million, which brought the tapering rule into play. Instead of having a total residence nil rate band of £350,000 (2 x £175,000), the amount available to her estate was reduced by £200,000 (£400,000/2) to just £150,000. If Jack had used his £325,000 nil rate band on first death to make gifts to beneficiaries other than Jill, there would still have been no IHT on his death, but Jill’s estate would have been correspondingly smaller on second death. As a result, the available residence nil rate band would have been £312,500 (£350,000 −£75,000/2). Planning point – Consider what gifts you could make over the next few years to use your exemptions and reliefs. The most widely known is the £3,000 annual exemption, which can cover any type of lifetime gift, in whole or part. The small gifts exemption covers any number of outright gifts of up to £250 per person – useful if you have plenty of grandchildren. The least well-known is the normal expenditure Regular gifts are exempt from IHT if you make them out of your income and they do not reduce your standard of living. Joan inherited her late husband Harry’s investment portfolio, but not his fondness for fast cars and fine wine. She found herself saving, on average, £2,500 a month from her income. In addition, there was £6,000 a year rolling up in the ISAs which she had inherited from Harry. She did not need this surplus income but was reluctant to give away the underlying capital in case it was needed to cover nursing home fees. She therefore chose to give her three children £12,000 a year each as birthday presents. The total annual gift of £36,000 matched her excess income and was therefore covered by the normal expenditure rules. To help her executors, Joan made sure she kept note of her income and expenditure, providing proof that she did not need the cash she was gifting. Charities, etc. : Gifts and bequests to UK charities, political parties and for the public benefit are exempt from tax. Charitable bequests can also result in the IHT tax rate on your estate being cut to 36%, provided these total at least 10% of your net estate. Wedding gifts: Wedding gifts are exempt, but subject to very modest limits (no more than £5,000) based on the relationship between the donor and the bride/groom. 100% relief is given for shares in unlisted trading companies (including some of those listed on the Alternative Investment Market (AIM)), sole trader or partnership business interests, owner-occupied farms and tenanted farms where the lease started after 31 August 1995. 50% relief applies to property and other assets owned by an individual and used by a trading company that they control, or by a partnership in which they are a The 50% relief also applies to tenanted farmland where the lease started before 1 September 1995. Taper relief: The amount of tax payable at death on a gift that was made within the previous seven years is subject to a sliding scale. For example, the tax payable on an outright gift made five and a half years before death is reduced by 60%. To clarify, the taper applies to the amount of tax, not the value of the gift. Therefore, a gift that attracts no tax cannot benefit from taper relief but is treated as part of your estate at death. Tax avoidance legislation has steadily increased over the years. For example, the ‘gift with reservation’ rules would prevent you making any IHT savings by putting your home in your children’s names and then continuing to live there rent free. Estate planning and IHT planning are often lumped together as a single process. If you have a spouse or civil partner, their long-term financial security will probably have a higher priority than tax planning. The use of trusts: Trusts are not just created to save They are often set up purely for estate-planning purposes,e.g. setting aside funds to meet the costs of educating grandchildren. Lifetime gifts: Currently gifts made in your lifetime that exceed the available annual and other exemptions escape IHT if they are made more than seven years before death. Some people ignore this generous treatment of gifts, because they are worried about their future income and security. Fortunately, the tools of financial planning can help alleviate these concerns. Maximising allowances, reliefs and exemptions: As far as practicable you should take advantage of the annual IHT exemptions, particularly the normal expenditure gift rule if you have (or can generate) surplus If you own a business or a farm, you need to ensure that you use the appropriate reliefs to the full. This has been made more difficult by rules on related loans introduced in 2013. You can also take advantage of IHT business relief by holding certain types of investment for at least two years; these include some (but not all) AIM shares, which can be held within ISAs. Pension planning: Changes in recent years to the pension tax rules have increased the importance of pensions in IHT A pension can provide you with the certainty of income that allows you to make lifetime gifts and represents an IHT-free fund. It is now possible for some pension plans to be passed down from generation to generation, free of IHT and possibly also free of income tax on any payments. Life assurance: For larger estates there will almost certainly be tax due on the estate at For married couples and civil partners, that tax bill usually arises on second death, because there is normally no point in incurring a tax charge any earlier. Life assurance can provide for this in a way that does not increase the size of your estate and will take advantage of your annual exemptions. It can also be possible to adjust your estate after your death, if the affected beneficiaries agree to any changes. This is done with a deed of variation, and could be helpful with, for instance, minimising IHT. Planning point – Achieving your estate planning goals and minimising the impact of IHT will involve a range of actions, starting with making the all-important will. The Financial Conduct Authority (FCA) does not regulate will writing, tax and trust advice and certain forms of estate planning.